I wake up in the wee hours of the morning, one or two am. Everything is still and silent. I am in my twenty degree bag and I feel cold. I have my micro fleece beanie on, I have the draw cord pull tight around my neck to keep the cold air out. How cold is it anyway? It's too cold to even check. I reach up and touch the tent over my head. It's frozen stiff. Finally I take my thin windbreaker and slide it over my head until I am wearing the hood over my beanie. Then I take the rest of the jacket and stuff it between my neck and the draw cord on my sleeping bag. Suddenly I feel warmer. I drift off to sleep. I wake up again as dawn's light begins to paint the eastern sky. It's still cold and the front stake on my tent decided to let go of the guy line. I spend a few minutes leaning out of my tent reattaching the line. Now I'm up and cold. I'll breakfast now, but I'm staying in my sleeping bag. This is always tricky because I don't want to spill anything on my sleeping bag and turn it into a bear magnet. I am successful. I have my granola and coffee. My tent is still frozen. I exit and begin to pack. It's not long until my hands and feet are freezing. So cold they hurt. Braveheart finishes packing and says, “I need to hike!” As she heads for the trail. I take down and pack my frozen tent. I can no longer feel my hands. It takes some effort and concentration to finish packing. The problem is the place I chose to camp. In a low spot near water will always be colder than a higher spot away from water. In the stress of my decision during the onset of the thunderstorm I didn't think things through very clearly. “I need to hike!” And so I do. I hike up the trail. Up and up. The first several miles of trail is up. Braveheart is somewhere out in front, probably hiking as fast or faster than I am. My feet and hands don't seem to want to warm up. I don't stop. I climb as fast as I can until I am huffing and puffing. Higher and higher. Into the sunshine away from the cold hollow where we camped. I catch up to Braveheart where she stopped to stretch in the warm sunshine. My hands and feet slowly stop hurting as I stand in the sun and stretch too. My stretching session is cut short. We are on a mission to make up the lost time we had yesterday. In order to accomplish our mission we'll need to hike twenty six miles or so today. Braveheart is focused on maintaining the pace so we arrive with enough light to cook, eat, and get ready to sleep. Braveheart walks so fast I struggle to keep up. I think it's good therapy for my right knee. It seems to be healed but after a few hours it gets achy. Maybe the exercise will eventually make the ache go away. The more we hike, the higher we get, the more obvious it is that last night's storm was not typical. There is fresh snow on the ground. We hike through the snow as it gets deeper and deeper. Deep enough to lose the trail. We only stay on it because someone has already walked it before us. We climb higher and higher. The sky's brilliant blue, no clouds in sight. We climb past Chicken Spring Lake and still we climb higher. Fresh snow from last night's storm blankets the ground. Other thru-hikers say they were so cold and they lost the trail. We climb up and over Cottonwood Pass, so now we are in the High Sierra. After the pass we descend into the Rush Creek basin. I meet Cappie and Shooter, two other thru-hikers we've played leapfrog with. 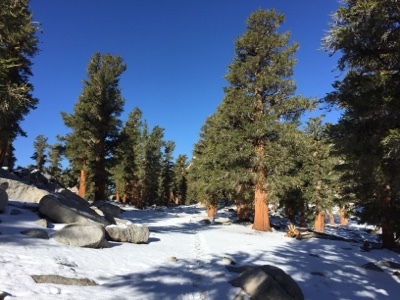 Our goal today is to reach Crabtree Meadows which will put us in position to summit Mount Whitney tomorrow. Since we stopped hiking early yesterday we have a lot of ground to cover. Braveheart is in front and we go as fast as we can. My right knee is definitely getting better. Even though sometimes it's achy or twangs when I twist it a certain way. I try to avoid twisting that way. I have found that when the trail is clear of rocks and slightly downhill I can sort of go into a free-fall mode where I take extraordinary long steps and really feel like I'm moving quickly. I couldn't do that with my knee the way it was but now I can. We walk all day, stopping once to dry our tents and sleeping bags. One of the realities of hiking the High Sierra in June is how wet everything is. I went from being so hot and dry that my mouth felt like cotton most of the time to being picky about where I pitch my tent in hope that it won't collect condensation. When it does then my sleeping bag ends up damp. The other thing why I am wet is that now we are having to cross streams flowing high with icy cold snow melt. Rush creek is our first test of our new reality. I wear my shoes so that my feet have better grip and protection the stream’s bottom is a bunch of slippery boulders. I cross without incident, but now my shoes are wet. I put my socks back on after crossing and now they are wet too. I use my trekking poles for hiking. I started this trip carrying them on my pack. I think that using trekking poles is really helping to protect my knee as well as make it easier to hike faster. The downside is I can't eat snacks while I am hiking. I pay close attention to Braveheart's breaks. When she stops for a snack I stop too and eat my snacks as quickly as I can. We pull into Crabtree Meadows late in the day. Meadows are wet places to camp. We decide to push on the the JMT and camp at the camp identified on it to save miles coming back to the PCT and to possibly avoid condensation. I am exhausted but also excited the my knee is basically healed and able to handle the miles and the pace that we are traveling. I make dinner as the darkness descends, once again I go to bed cold, so cold.